Let’s say you have a Folder B that contains references to a file placed in Folder A. If you move the Folder B to trash or if you remove the file from Folder B, the original file is deleted from the original Folder A as well. In such cases you may need to remove the placed file from Folder B before deleting the folder. 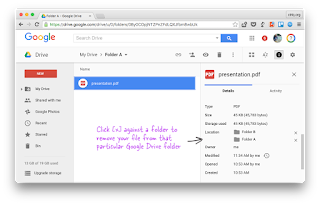 In Google Drive, select the file that is placed in multiple folders and open the activity sidebar. Here you’ll see a list of all folder that the file belongs to. All you need to do is click the little [x] symbol to remove that file from any folder in the list.